Which New Orleans Cemetery Is Best? 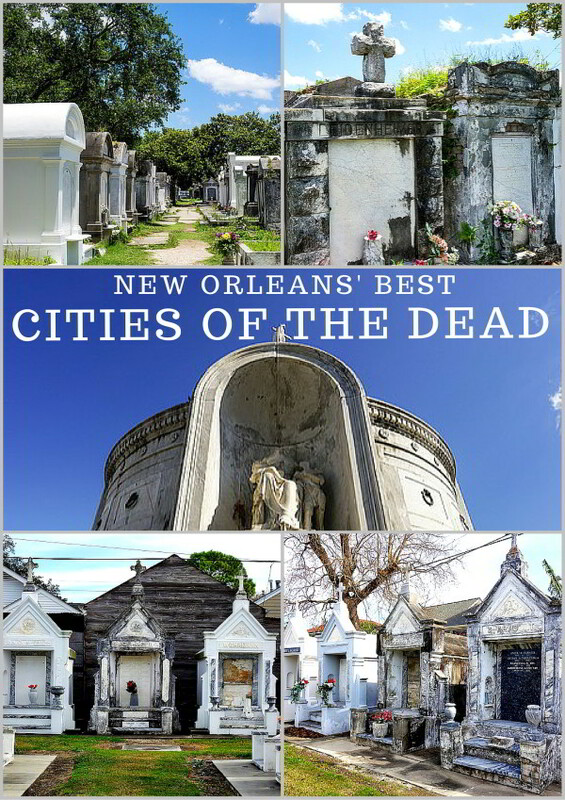 New Orleans is known around the world for the unique way we bury our dead, in above ground cemeteries and mausoleums. But what if it’s your first trip to New Orleans and you want to make the most of your short stay here? The decision of which New Orleans cemetery is best is a matter of personal preference, so while we can’t declare a winner, we can help you understand key differences between the most popular New Orleans cemeteries so that you can schedule a trip to your favorite burial ground. One of the oldest, most famous and most haunted cemeteries in New Orleans is also the closest to Hotel Monteleone. St. Louis Cemetery No. 1 is located just a few short blocks from our hotel at the corner of St. Louis & Basin Streets, but you’ll need to join a tour group to visit this one. In 2015, the Archdiocese of New Orleans began restricting access to this historic cemetery in order to protect and preserve it for generations to come. Founded in 1789 and listed on the National Register of Historic Places, this cemetery houses more than 700 tombs and over 100,000 deceased, including the graves of Voodoo Queen Marie Laveau as well as noted New Orleanians Etienne de Bore, who was a pioneer in the sugar industry, Homer Plessy, of the landmark Supreme Court segregation decision Plessy vs. Ferguson, and world famous chess champion Paul Morphy. 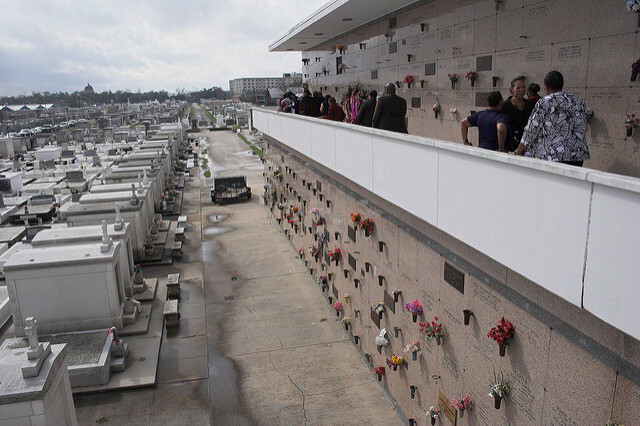 This cemetery was also featured in the classic 1969 film, Easy Rider, and houses the pyramid-shaped tomb that actor Nicholas Cage has reserved as his final resting place. Daily walking tours are offered through French Quarter Phantoms and local non-profit Save Our Cemeteries. Located at Washington Avenue at Prytania Street, one of the entrances to this cemetery lies directly across from the iconic Commander’s Palace restaurant. This cemetery is one of the safest and most well-kept burial grounds in New Orleans, and while tours are available, you can easily explore this cemetery on your own. Art lovers will enjoy St. Louis Cemetery No. 3, located on Esplanade Avenue near Bayou St. John, City Park and the New Orleans Museum of Art. This cemetery, one of the largest in the city, is home to a number of elaborate burial vaults of Greek Orthodox and Masonic design, as well as the tomb of famed Storyville photographer E. J. Bellocq. 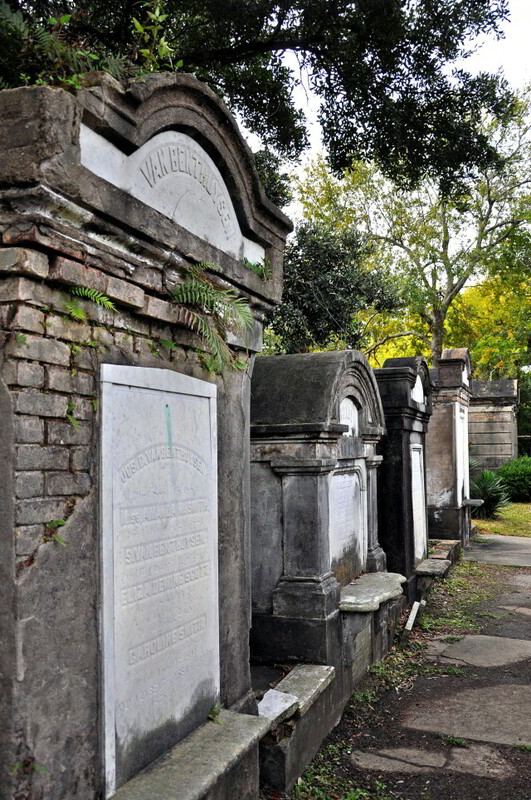 This cemetery is easily accessible from the French Quarter via the #91 Jackson-Esplanade bus line, which you can catch at N. Rampart Street and Esplanade Avenue. It will drop you off near the front gates of the cemetery. You can also take the Canal streetcar (City Park/NOMA line) and walk just two blocks across the bayou on Esplanade to enter the cemetery. 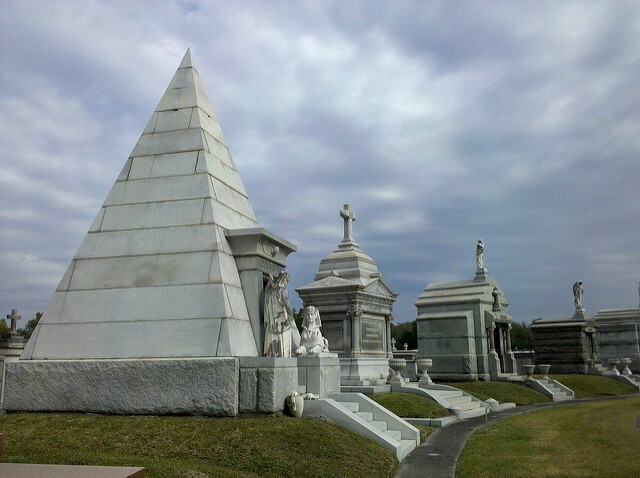 This expansive cemetery is home of some of the most interesting visuals of all New Orleans cemeteries: points-of-interest here include a pyramid shaped vault and the “Weeping Angel” statue in the Hyams family tomb. The Metairie Cemetery is the final resting place of notable New Orleans musicians Louis Prima and Al Hirt, as well as many local restaurateurs, including Al Copeland, creator of Popeyes Fried Chicken, and the founding owners of Antoine’s, Galatoire’s, Brennan’s and Arnaud’s restaurants. It’s easy to get to Metairie Cemetery from the front steps of Hotel Monteleone: take one of the nearby Canal St. streetcars marked “Cemeteries” to the end of the line. After disembarking, walk to the corner of Pontchartrain Blvd. and Metairie Road, where you can walk up the steps into the original cemetery entrance. For something a bit more off the beaten path, the St. Roch Cemeteries & Chapel offer a unique glimpse into the history of an up-and-coming New Orleans neighborhood. Located just a few blocks from the recently revitalized St. Roch Market and St. Claude Avenue arts district, the adjoining chapel here contains more than a century’s worth of unusual offerings, left by neighborhood parishioners to thank St. Roch for healing them. 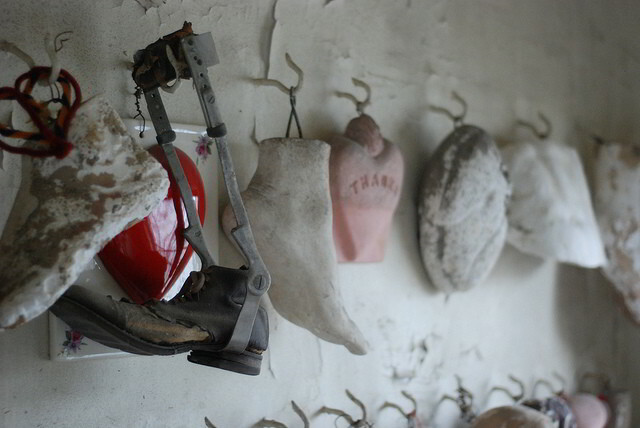 The strange offerings inside the St. Roch chapel include false teeth, plaster casts of feet, and the leg braces of cured polio patients. To get the most out of this cemetery excursion, consider taking a bicycle tour: Confederacy of Cruisers offers tours which stop at St. Roch Cemeteries. No matter which cemetery you decide is your favorite, there is one choice that is clear: there is no better place to start and end your day in New Orleans than Hotel Monteleone. 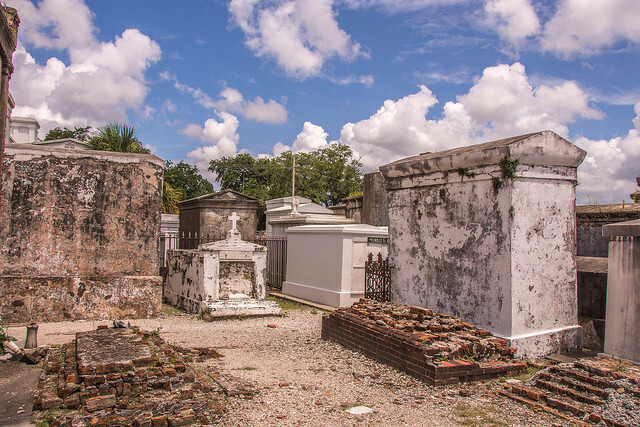 Book your next trip to New Orleans today, and let us know on Facebook or Instagram… which New Orleans cemetery is your favorite?